Dawson provides live video streaming to JVC's VIDEOCLOUD. London, September 2016: Dawson, which manufactures Ka-band satellite antennas and provides integrated broadcast transmission solutions, are working with JVC to provide live connectivity for its VIDEOCLOUD online video and live streaming platform. Launching at IBC2016 in Amsterdam on JVC’s stand (Hall 12 F.31), the powerful content management system is demonstrated as a complete communication package. 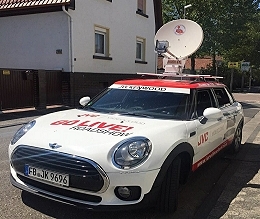 At the show, JVC’s Mini Clubman vehicle will have the Dawson antenna installed on the roof. By deploying Dawson’s GC-Zero 70K antenna – the client can uplink live HD content back to base via Eutelsat’s KA-Sat satellite and local backhaul IP connectivity. The Dawson GC-Zero 70K antenna, which this year won the prestigious Queen’s Award for Innovation, is fully auto-pointing and does not require a satellite engineer to operate it. It is fully Eutelsat type approved and has been demonstrated to be one of the fastest and most reliable auto-pointing antennas within the industry. JVC VIDEOCLOUD enables you to stream live from JVC’s range of streaming camcorders, along with cameras from other manufacturers, and you can also stream directly from Streamstar’s range of multi-camera production tools. JVC VIDEOCLOUD lets you broadcast live events from anywhere in the world; record the broadcast and use cloud-based transcoding to provide the best user experience possible. JVC VIDEOCLOUD also manages your video library by enabling categorizing, metadata adding and managing access rights, all from a computer or smart phone.